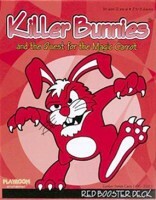 Killer Bunnies are back, and no one is safe with Red bunnies, each having a special power! The Red Booster Deck adds 55 cards to your existing set, plus a Red twelve-sided die. Other Fantastic cards include: Rooney’s Weapons Emporium to give players a second Killer Bunnies market to buy back used weapons, Defense Cards to eliminate weapons, Barriers to protect your bunnies from Roaming Run cards, and four Carrots – now there are 16 to collect! Can you defeat the Quite Irascible Diffractable Cheese Balls? Can you even say Quite Irascible Diffractable Cheese Balls? Send bunnies three rounds ahead in time with Bunny To The Future! The laughs continue as this wild and wacky Red Booster Deck delivers more intense strategy and even more Carrot grabbin’ fun! After reviewing KB Quest recently for the site – I realized that the full potential of the Killer Bunnies game isn’t really realized until you add in many of the expansions. You know how it goes…a designer will create a game, release it and then have 25 brilliant ideas after the fact – these are known as expansions. Ok sometimes they plan them in advance. But Killer Bunnies – as with some other games with expansions: (Dominion, Race for the Galaxy, etc) – really play BETTER with some of the expansions. In any case, it creates a new play experience for a game you already know how to play. Noticing that some (but not all) of the expansions are presented here, I would like to offer information and review each specific expansion, their components and their affect on adding them to the Blue/Yellow Starter Set – and in chronological order of release. So if you don’t know how to play Killer Bunnies, I wont explain it now. If you are interested please check out that page here on this site. –	A new Market card – Rooney’s Weapons Emporium, which will allow players to buy weapons back that have already been used in the game. The game also comes with a red d20 for use with some of the new cards in the set. KB RED adds some powerful cards into the mix, but mainly two new gameplay affects that change things up a bit. Rooney’s Weapons Emporium is a starter card that is open when play starts. When a weapon card is played it goes to this market instead of the discard pile. Then later, players can use their Dollas to purchase those weapons at a cost equal to their strength. 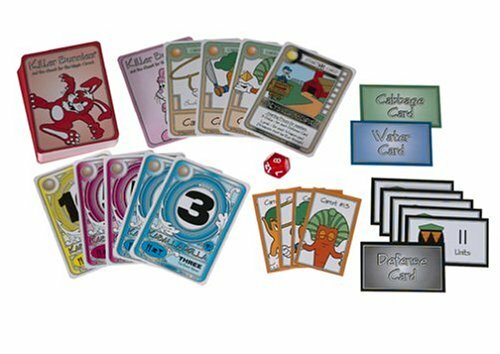 The Defense cards are small cards (Like the Cabbage and Water Cards) that players can also purchase to protect them when a player is rolling the die while attacking. The number is simply subtracted from the die roll – like the Lucky Clovers except they are used and discarded. These two main additions are not that crucial to the game. The defense cards are useful but player really are saving money to purchase carrots. The Weapons Emporium also is a good idea –but only the powerful weapons are useful to buy back, and even then, if you have 10 Dollas to spend on a Nuke, you should probably just buy a carrot since that’s how you win the game. The other cards that have been added very Special and Special cards add the true gameplay differences. Adding 4 new Carrots to the game allows for more players and better distribution of Carrots. And the new Red Bunnies are a good addition as well. This was the first expansion for KB Quest and although there are some great additions to the game, its not a must have. That said, the great thing about the KB Quest game overall is that you can add in and take out as many expansions and even cards from those expansions as you want. So my advice is… get this expansion (It’s only $10) if only for the new Carrots, the Weapons, Special and Very Special cards, and add what you like. KB RED is balanced out of the box. If you use all the cards from this expansion, and cycle out another – it works very well. If you choose to add some of the cards, be careful to include the Dollas, Red bunnies and Water and Cabbage to make the deck percentages work out properly. Coming up next… KB Violet. Add a Review for "Killer Bunnies: Quest – Red Booster"